As an athlete I train to endure pain and override doubt and fear and limitation of all kinds. Yet I have often asked, and been asked the million dollar question: how do you know when to push through the little voice in one’s head that says, “don’t go, don’t race today, go back to bed instead,” or to the not so subtle utterance of a hamstring cringing at sitting in the car for 3.5 hours to drive to and from a race, or alternatively, to the voice that says “go anyway, it’s supposed to be uncomfortable—it’s never a walk in the park”? In truth, many of my best athletic performances have occurred when I wasn’t feeling the race love but sucked it up and raced anyway. In those instances I have discovered that the pressure is lessened and so you can actually get OUT of your own way. Of course, at other times this Zen approach backfired and a rough feeling at the start ended in a rough feeling at the finish. Nonetheless, all of those experiences build a repertoire with which our intuition checks in in the face of an uncertain race start. I was registered to race the open water 5km provincials in Welland yesterday. No doubt that would have been outstanding practice for the Ironman swim particularly because it was a non-wetsuit race. Yet, all day Saturday and all morning Sunday there was just the slightest difference in tone in that voice of dissuasion in my head. I listened to my gut which was decidedly against racing and am certain it was the right decision. My hamstring was particularly grateful for the space of my apartment, and the stretch of sidewalks and grocery aisles that took the place of a cramped car seat. Moreover, this decision gave me pause to remember that no one, not your coaches (even when they are your best friends:), or your family members, or even your training partners, knows your body like you do. As an athlete you need to know how to balance essential and constructive direction (of coaches etc) with your own instruments and within your own parameters. Sometimes the universe offers you instantaneous feedback in a confirmation that your decision was right. After I stayed home from the race yesterday, I discovered the 5km was cancelled due to the weather. Phew. So glad I didn’t drive out there for nothing! Congrats to Mike and Ayesh on their awesome races at Bracebridge yesterday! 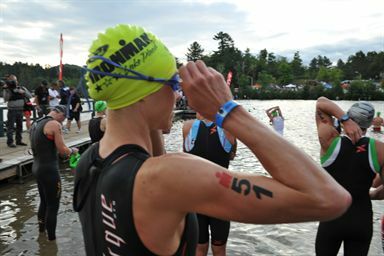 Here’s a few swim pics from Lake Placid…because there weren’t any from Welland. 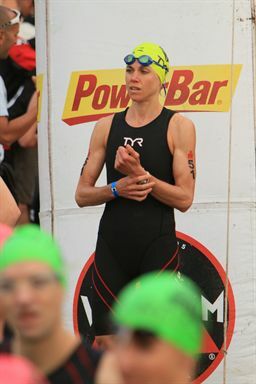 I LOVE my TYR TORQUE!